Priyanka Gandhi Vadra and Jyotiraditya Scindia were appointed AICC general secretary in-charge Uttar Pradesh East and Uttar Pradesh West respectively in January and took charge last week. 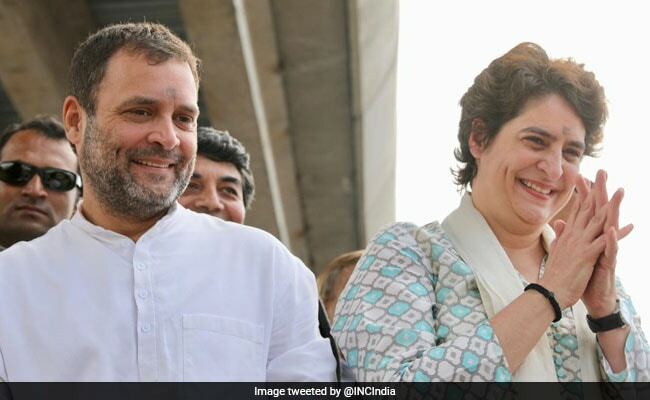 Priyanka Gandhi Vadra and Mr Scindia were appointed AICC general secretary in-charge Uttar Pradesh East and Uttar Pradesh West respectively in January and took charge last week. Among the constituencies placed under Priyanka Gandhi Vadra's charge were the key seats of Lucknow, Amethi, Raebareli, Sultanpur, Gorakhpur, Varanasi, Phulpur, Allahabad, Barabanki, and Kushinagar. Saharanpur, Kairana, Muzaffarnagar, Moradabad, Ghaziabad, Mathura, Pilibhit, Dhaurahra, Kanpur, and Farrukhabad, were some of the key constituencies placed under Mr Scindia's charge. A day after making her debut in Uttar Pradesh's political arena as Congress's general secretary, Priyanka Gandhi Vadra Tuesday got down to business, holding a marathon strategy session at the party office in Lucknow to script her party's victory in the upcoming parliamentary polls. In an adjoining room, the newly appointed Congress general secretary in-charge of western UP, Jyotiraditya Scindia, held deliberations with leaders from the constituencies he has been asked to groom. Priyanka Gandhi Vadra and Jyotiraditya Scindia, along with Rahul Gandhi, had held a grand roadshow on Monday, raising hopes of a turnaround in the party's fortunes.